Big Brother 2009, also known as Big Brother 10, was the tenth series of the British reality television series Big Brother. The show followed a total of twenty-two contestants, who were isolated from the outside world for an extended period of time in a custom built House. Each week, one or more of the housemates were evicted by a public vote. The last remaining housemate, Sophie Reade, was declared the winner, winning a cash prize of £71,320. The series launched on Channel 4 on 4 June 2009 and ended on 4 September 2009, lasting 93 days - the joint-second longest British edition of Big Brother to date (together with the seventh and ninth series, and one day shorter than the eighth series). Davina McCall returned as presenter for her tenth consecutive year. Sixteen housemates entered on launch night, with an additional six being introduced in later weeks. Big Brother 10 was watched by an average of 2.5 million viewers. It was the lowest rated series of the show since its inception, becoming the first series to draw an average of less than 3 million, and remains the lowest rated series of Big Brother to be broadcast on Channel 4. During the series, Channel 4 announced that it would not be renewing its contract to show the series with Endemol once it expired in 2010, meaning that the subsequent eleventh series would be the last to be broadcast on Channel 4. This series was filmed at Elstree Studios. Big Brother 10 was produced by Brighter Pictures, a division of Endemol. This series of the programme had been confirmed since 2006 as part of a £180 million contract between Endemol and Channel 4. Phil Edgar-Jones was the creative director of the series whilst Sharon Powers was the executive producer. Open auditions for the programme, which were confirmed during the final of Celebrity Big Brother 6, began on 3 January 2009 in Edinburgh and ended on 7 February in Manchester. Internet auditioning via YouTube, which saw 2,600 apply, ended on 3 February 2009. Auditionees were subjected to three interviews with various producers, additional meetings with a psychologist and a psychiatrist and a final "talk of doom", in which they were warned about the negative impact that appearing on Big Brother could have on their lives. In the weeks preceding the series, the selected housemates were put into "hiding" with no access to the outside world. Housemates were offered aftercare from the production team for up to six months after they left the programme. The programme's logo, the Big Brother Eye, is based on a black, purple and blue thumbprint and was released on 11 May. It was designed by Daniel Eatock. From 19 May, Channel 4 began uploading teaser clips to the official Big Brother UK YouTube channel; these were also aired during commercial breaks on Channel 4 and its related channels. The series was sponsored by Lucozade Energy and the promotional break bumpers were created by M&C Saatchi and are based upon a 'little brother versus big brother' scenario. The programme began on 4 June, with a 95-minute special programme which introduced the initial 16 participants, and was broadcast on Channel 4 and E4 over a period of 93 days, concluding with the final on 4 September. The main television coverage of Big Brother 10 was screened using daily highlights programmes, narrated by Marcus Bentley. These episodes summarised the events of the previous day in the House. Alongside these highlights shows were spin-off programmes, Big Brother's Big Mouth and Big Brother's Little Brother, that commented on fandom, cultural reaction to the events within the House and included interviews with celebrities, former housemates and family and friends of housemates. On Fridays, a live eviction programme was hosted by Davina McCall in which the evicted contestant left the house and received an interview from McCall and two guests. For 2009, BBLB returned with George Lamb presenting five weekday evening programmes and one Sunday edition per week. Big Mouth was also fronted by McCall and was broadcast on E4 on Friday nights for an hour after the main eviction programme. The panel was not used for the finale, however, Judi James made a recorded segment about each finalist. The panel format was scrapped for the following celebrity and regular series, where McCall interviewed the evictee in the traditional format. As with each series since Big Brother 2002, the programme was filmed at Elstree Studios in Borehamwood, Hertfordshire. A total of 27 editing suites, manned by over 300 members of staff, were situated in the "George Lucas Stage" to produce the programme. In the 18 May issue of Star magazine, aerial photographs of the House were published, showing the garden under construction. Official pictures of the House interior were released by Channel 4 on 1 June, showing the entrance stairway, living room and garden. The entrance stairway had images of insects on its walls whilst the garden and living room had a science fiction theme; the former included a bus stop as the designated smoking area. On 3 June, Metro published an image of the Diary Room, which has a multicoloured chair and wall pattern. There was also a shipping container-based bathroom, a sitting room with red sofas, a wood panelled kitched with purple, black and white fittings and a bedroom with splats of paint covering the walls. The house contained 44 cameras, 75 two-way mirrors and 57 fixed microphones, as well as individual microphones for each housemate. The format remained largely unchanged from previous series. Housemates were incarcerated in the Big Brother House with no contact to and from the outside world. Each week, the housemates took part in a compulsory task that determined the amount of money they were allocated to spend on their shopping; if they passed, they received a luxury budget and they were allocated a basic budget if they failed. Housemates were instructed to nominate two fellow housemates for eviction each week. This compulsory vote was conducted in the privacy of the Diary Room and housemates were not allowed to discuss the nomination process or influence the nominations of others. On Day 68, Big Brother changed the rules to allow housemates to discuss nominations until further notice. The two or more housemates who gathered the most nominations per week faced a public vote and the housemate receiving the most votes was evicted from the House on the Friday and interviewed by Davina McCall. Housemates could voluntarily leave the House at any time and those who broke the rules could have been ejected by Big Brother. In a change from previous series, Channel 4 announced that it would no longer donate any of its income from the premium-rate telephone lines, by which viewers vote for whom they would like to see evicted or win the programme, to charitable organisations. The broadcaster said that the current economic downturn is to blame for this decision and that the change would bring Big Brother into line with other programmes of its kind, such as The X Factor and Strictly Come Dancing. The format of the live eviction interview programme was altered for this series. Unlike previous series in which McCall interviewed evicted housemates by herself, she was instead joined by two guest panellists to "interrogate" the evictee. Panellists included former housemates, journalists, psychologists, and fans of the programme. A new rule was added to the programme at the start of the series; "fake romances" were not permitted. Big Brother 10 saw 22 contestants competing to win. Sixteen participants entered the House on Day 1 and an additional five housemates entered the House on Day 44, followed by one other on Day 56. Angel McKenzie (born 10 June 1973) is a 35-year-old professional boxer and artist from Moscow, Russia. She is the adoptive daughter of former British and European light welterweight boxing champion, Clinton McKenzie She became a housemate as the result of a public vote on Day 4. She kept her birthday a secret from her fellow housemates, celebrating it alone in the Diary Room. On Day 21, in a special live nominations show, she was nominated for the first time. On Day 23, became the fourth housemate to be evicted with 81% of the public vote. Bea Hamill (born 28 September 1984) entered the House on Day 44 with four other new housemates. Alongside them she was tasked with ensuring that Noirin and Halfwit received the most nominations but refused to participate claiming it went against her morals. She was evicted on Day 79, in week twelve just one week before the final. Beinazir Lasharie (born 8 January 1981) is a study support assistant from Pakistan. Her family, after receiving death threats due to their support of former Pakistani Prime Minister Benazir Bhutto were given asylum in the United Kingdom when she was a year old. On Day 4, Beinazir did not gain full housemate status by public vote and became the first evictee. There was no crowd present as she left the House and she was escorted from the premises in a red AEC Routemaster bus. Cairon Reon Austin-Hill (born 5 July 1990) is a student and the youngest contestant in this year's Big Brother. Charles Andrew "Charlie" Drummond (born 3 January 1987) is a 22-year-old Jobcentre customer service advisor from Cleadon. Frederick "Freddie/Halfwit" George Fisher, (born 21 June 1985) is an Oxford graduate. On Day 26, Halfwit was nominated for eviction along with Sree, surviving for the fourth consecutive time on Day 30 with 15% of the public vote. Halfwit survived the most consecutive evictions out of anyone in the history of the show, having survived the public vote 5 times in a row and 7 times in total. On Day 72 as a special prize, Halfwit and Dogface legally changed their names back to Freddie and Sophie. On the same day Freddie was evicted from the house over Marcus gaining 53.6% of the public vote to evict. Hira Habibshah entered on Day 44, and was given a secret mission in which she had to brief her fellow new housemates, it involved ensuring that Noirin and Halfwit were nominated. The task was failed, resulting in her nomination along with the other new housemates. On Day 59, she was named the 'Most Entertaining Housemate' by Big Brother. On Day 65 she became the ninth person to be evicted with 5.65% of the public vote. Isaac Stout was a castmember on MTV's The Real World: Sydney in 2007 where he entered into a relationship with fellow Housemate Noirin during the series despite his fear of commitment. He ends up walking out of the House after Noirin is evicted on Day 58. Karly Ashworth (born 14 April 1988) is a part-time glamour model from Fife in Scotland. She was polled as one of FHM's Top High Street Honeys. She became the seventh housemate after being tricked into believing that she had a motorbike ridden over her stomach. On Day 39, Karly was nominated for eviction by her fellow housemates. Karly was evicted on Day 44, the same night as her boyfriend, Kenneth, entered the house as a new housemate. Kenneth Tong entered the house on Day 44, minutes before his girlfriend Karly was evicted. Alongside his fellow new housemates, he had to ensure that both Noirin and Halfwit were nominated for eviction but the new housemates failed their task so faced the public vote. Tong blamed fellow housemate Bea Hamill for the task's failure as she had refused to participate on "moral grounds". Following an argument between the pair, Tong was warned by Big Brother for language that "could be perceived as threatening" when he said he would "pay someone to deal with her". On Day 50, Kenneth fled the house via the rooftop with Marcus' assistance. As a result, the eviction for week eight was cancelled. Kris Donnelly became the fourth person to be confirmed as a housemate when he was selected by Lisa, who had earned the privilege to choose by answering a ringing phone. On Day 33, Big Brother told Kris to remain silent until 2 a.m. as punishment for discussing nominations or automatically face the public vote. He failed to keep quiet and faced eviction. On Day 37, he was evicted with 63% of the public vote. Lisa Elizabeth Wallace (born 12 February 1968) is the oldest contestant in the series who entered the House with a distinctive pink mohican haircut, which she shaved off during the series. She became the third person to be rewarded with housemate status when she answered a ringing telephone. She was evicted on day 90 in the final eviction of the series with 68.59% to evict. Marcus Akin (born 10 August 1973) was made a housemate as the result of a public vote on Day 4. On Day 29, Marcus was warned about comments he made to fellow housemate Sree, which Marcus hotly denied. On Day 50, he helped Kenneth Tong escape from the Big Brother house. Marcus was the twelfth housemate to be evicted with 64% of the vote on day 86. Noirin Kelly also appeared on The Real World: Sydney in 2007 as the girlfriend of fellow contestant Isaac Stout. She was granted housemate status when she allowed Rodrigo to shave her eyebrows and draw a moustache and glasses with permanent marker on her face. She had to do this every day until further notice. On Day 58, Noirin was evicted from the Big Brother house with 60.0% of the public vote. Outside of the house in September 2009 Norin appeared on the front cover of Nuts and 10 pages of the magazine consisted of pictures of her and an interview with her. Rodrigo Lopes (1 December 1985) is a Brazilian student living in Leeds. Rodrigo was the twelfth person to enter the house and earned housemate status after convincing Noirin to allow her eyebrows to be shaved and to draw a moustache and glasses on her face under the order of Big Brother. At the time of Big Brother's filming, she presented and identified as male, but she now identifies as female and is now known as Rebekah Shelton. Saffia May Corden (born 14 October 1981) is a beauty consultant from Hucknall, Nottingham and single mother of two children. She became a housemate for successfully walking barefoot on broken sugar glass, believing it to be real glass. She walked from the House on Day 8. Siavash Sabbaghpour (born 25 April 1986) is an event organiser who left his homeland Iran at an early age to live in London. Siavash was made a housemate as the result of a public vote on Day 4 and finished in second place. Sophia Brown was made a housemate as the result of a public vote on Day 4. On Day 6 Sophia was nominated for eviction by her fellow housemates. On Day 9 she became the second evictee with 91.2% of the public vote. Sophia passed away on 17 May 2012. Sophie/Dogface Victoria Reade (born 18 May 1989) is a glamour model from Nantwich, Cheshire, has appeared in Hot Shots Calendar and was the winner of the series. Reade changed her name by deed poll to Dogface, to become a house-mate during the show's first week. On Day 33 Big Brother told Reade that she had to remain silent until 2 am as punishment for discussing nominations; she failed to keep quiet and therefore faced the public vote. Reade had a romantic relationship with Kris in the House. On Day 39 she and Siavash were punished by Big Brother for talking about nominations, and told they were not allowed to swear before 3 pm; they both failed and faced eviction. On Day 72, as a special prize, Dogface (Reade) legally changed her name back to Sophie. Since Day 88, Sophie was the bookies' favourite to win. She left the house to huge cheers and a lively crowd chanting her name. Sree Dasari (born 14 September 1984) is from India. A students' union president, he was in the United Kingdom studying for a master's degree in International Business at the University of Hertfordshire in Hatfield. He was made a housemate as the result of a public vote on Day 4. On Day 31, with 85% of the public vote, Sree became the fifth evictee and crowned Best Housemate Award for the season 10. He attempted suicide by slashing his wrists shortly after being evicted. Thomas "Tom" Oliver (born 3 April 1982) entered on Day 44. On Day 53, Tom voluntarily left the Big Brother after 9 days. During the first three days, the group undertook a series of tasks by which they could earn the right to become housemates. The remaining non-housemates were instructed to change into a special uniform. Anyone not obeying would lose the opportunity to become a housemate. Lisa gained housemate status in the early hours of Day 2 when she answered a ringing phone in the living room. Given 15 minutes to select the fourth housemate, she chose Kris. Charlie and Saffia later became housemates after walking barefoot over broken sugar glass, believing it to be real glass, and Karly became the seventh housemate after being tricked into believing that she had a motorbike ridden over her stomach. Freddie and Sophie became housemates after changing their names, documented by deed poll to Halfwit and Dogface respectively. On Day 3 Cairon earned housemate status by dunking a biscuit in a cup of tea for 25.5 seconds without it disintegrating. Remaining non-housemates Angel, Beinazir, Marcus, Siavash, Sophia and Sree faced the public vote on Day 4 to determine which five would become housemates and which one would be evicted. With 6.8% of a vote to save, Beinazir became the first evictee without ever becoming a housemate. The first round of nominations took place on Day 6 and resulted in Halfwit and Sophia facing the public vote. On Day 8, the first shopping task saw Kris negotiate his way through a field of laser beams to retrieve the "Emerald of Hope", with one of his fellow housemates being soaked by a bursting balloon full of gunge whenever he interrupted a beam. He completed the task successfully, earning a luxury budget. However, as punishment for Marcus, Sophia and Sree discussing nominations, Big Brother doubled the price of every item on the shopping list. Later that day, Saffia left the House voluntarily to be with her children and Sophia was evicted with 91.2% of the public vote the following night. The housemates successfully learned and performed the song and dance routine "Me Ol' Bamboo" from the film Chitty Chitty Bang Bang and won a luxury shopping budget of £5 per person per day. Day 18, the first day of week three, began with a day-long hippy-themed celebration of Halfwit's 24th birthday, in which Big Brother gave him the "Gift of Normality" that he could keep for himself or give to either Dogface or Noirin. He chose Noirin, freeing her from the obligation to draw a moustache and glasses on her face each day. The housemates failed every part of the Tudor-themed shopping task and received only a basic budget. During the task, Siavash, playing King Henry VIII, was called upon to ban one housemate from nominating and to grant another immunity. He chose Charlie and Marcus respectively. On Day 21, the housemates nominated against the clock in a live programme, resulting in Angel and Halfwit facing the public vote. In an Italy-themed shopping task, Siavash played the role of a fashionista who was required to change his outfit at Big Brother's request and strike a pose whenever Madonna's "Vogue" was played into the House. Sree and Dogface's contribution was to run a 24-hour ice cream delivery service, while Marcus and Noirin created paintings based on the works of Leonardo da Vinci and Sandro Botticelli. Charlie and Kris played Italian footballers and Lisa had to predict football scores correctly. In week five, on Day 33, Big Brother punished Charlie for discussing nominations, telling him to remain silent for the rest of the day or else face the public vote. Later, Dogface and Kris were similarly punished, also for discussing nominations. All three failed to keep quiet and faced the public vote, along with Halfwit and Marcus, who received the most nominations. On Day 35, the housemates failed the circus-themed shopping task and received a basic shopping budget. On Day 37, Kris became the sixth person to be evicted from the House with 63.0% of the vote. In week six, on Day 39, Big Brother told Siavash and Dogface that, because they had discussed nominations earlier in the week, they would face eviction if they uttered a single profanity before 3 p.m. They both failed and therefore faced the public vote, along with Karly and Noirin who received the most nominations. The shopping task consisted of nine separate challenges from previous editions of Big Brother, in which housemates had to compete against former contestants (see the week seven shopping task section). The housemates failed to pass the required number of challenges and therefore failed the overall task. On Day 44, five new housemates, Kenneth, Bea, David, Hira and Tom entered the House and Karly became the seventh person to be evicted with 50.4% of the vote. Week seven saw housemates take part in a Greek-themed shopping task with a twist, which involved Charlie and Rodrigo learning a routine by Stavros Flatley, a dance duo featured on Britain's Got Talent. However, playing Zeus, Halfwit was the only housemate aware of the true nature of the task. In each of three challenges he had to ensure, while still keeping the secret, that his chosen champion defeated the appropriate Greek god. He failed and the housemates received a basic shopping budget. Bea, Charlie, David, Dogface, Halfwit, Hira, Kenneth, Marcus, Noirin, Siavash and Tom all faced eviction. In the early hours of Day 50, Kenneth escaped from the House via the rooftop with help from Marcus, and this led to the eviction being cancelled. In week eight, in the early hours of Day 53, Tom voluntarily left the Big Brother House. For the shopping task the housemates split into two groups, creating human puppets with one housemate providing the head and feet and another providing the arms, and making them dance to music by Girls Aloud and Take That. Visitors to the Big Brother web site decided by voting that the housemates had failed the task. On Day 56, Noirin's ex-boyfriend Isaac entered the House, but left voluntarily shortly after Noirin's eviction on Day 58 with 60.0% of the public vote. Bea and Marcus received the most nominations in week nine, but Marcus's attempts to persuade the housemates to nominate him and Siavash's refusal to nominate backfired when Big Brother declared the result void and made all housemates face the public vote to save, not evict. The shopping task was based on Lewis Carroll's Victorian children's novel Alice's Adventures in Wonderland in which Hira, in the role of Alice, having first been "shrunk" in the Diary Room, spent more than five hours searching for a key buried inside a giant cupcake using only her face. The housemates passed the task and received a luxury shopping budget. In week ten, following continual rule breaking by a number of housemates, Big Brother decided to allow the discussion of nominations until further notice. Halfwit and Marcus received the most nominations and faced the public vote. The housemates took part in a "Best of British" shopping task in which they had to bog snorkel, play the bagpipes and convince Rodrigo he had met the Queen, who was in fact the impersonator Janette Charles. On Day 72, as a special prize for succeeding in this task, Halfwit and Dogface legally changed their names back to Freddie and Sophie. In the House of Horrors-themed shopping task Charlie, in the role of Dr Frankenstein, played a version of the game Operation in which Bea, playing his Monster, received a shock whenever his hand faltered. On Day 79, Bea was evicted with 88.2% of the vote. After a housemate was evicted, they were subject to an interview with Davina McCall. The housemates participated in a future-related task during week twelve, in which Sophie and Rodrigo learned a robotic dance routine to Daft Punk's song "Harder, Better, Faster, Stronger" and Lisa and David left the House with instructions to have photographs taken by members of the public in front of three London landmarks whilst dressed as aliens. While they were away, the rest of the housemates attempted to break out of the House and Big Brother responded by reducing the £100,000 prize fund to zero, later announcing that the housemates would be given a chance to win back the money over the course of the next few days. As Siavash refused to nominate, Big Brother allocated his nominations to Charlie and Sophie and Marcus and Siavash were put up for eviction. On Day 85, Siavash accepted the offer of £10,000 towards the prize fund for exchanging his clothes with an outfit provided by Big Brother and the Housemates received a £20 cheque after requesting a mystery prize from the weekly shopping list. Later that day, Marcus rejected Big Brother's offer of £15,000 to shave his ponytail and the group turned down the chance to win £1,500 by swimming 1,500 lengths of the pool. On Day 86, Rodrigo won £6,000 towards the prize fund by correctly guessed the regional locations of three animals after listening to a series of sound effects. Later that day, Marcus was evicted with 64.0% of the public vote. The housemates competed in a "task with no name" on Day 87, the first day of week thirteen. In this task, the Housemates were provided with several challenges and puzzles but were unaware that they all had to leave the room in order to pass. The housemates passed the task and added £10,000 to the prize fund. The following day, the housemates' previous nominations were shown to the group and Big Brother set them a quiz on what they had seen in order to add money to the prize fund. The group answered 53 of the 60 questions correctly, gaining £5,300 to the winner's prize. A round of nominations took place on this day, which Charlie, Siavash and Sophie refused to participate in. This meant that all of the housemates faced eviction, as David, Lisa and Rodrigo received the most eligible nominations. On Day 89, the housemates were shown the episode of Big Brother which documented Day 50 in the House and were told to re-enact it over a five-hour period. They passed this task, earning a luxury shopping budget. However, in order to view the reconstruction the group had to replicate the music video of "Single Ladies (Put a Ring on It)", a song by Beyoncé Knowles. The group did so, with David portraying Knowles, and were therefore rewarded with a screening of the task after Lisa was evicted with 68.6% of the vote. On Day 91, Charlie, Rodrigo, Sophie and Siavash were instructed to rank themselves in different categories, such as order of selfishness and likelihood to win. David, who was isolated in the Diary Room, had to answer questions based on their answers. As he answered four of the ten questions correctly, he added £40,000 to the prize fund. This meant that the prize fund was settled at £71,320. After Lisa's eviction on Day 90, the viewers began voting for who they wanted to win the programme. On Day 93, the final day, Rodrigo was the first to be evicted with 11.0% of the five-way vote and he was followed by Charlie, who received 13.2% of the five-way vote. It was then announced that David had finished in third place after gaining 19.0% of the three-way vote. Davina McCall then revealed that Sophie had won this series with 74.4% of the final two-way vote, with Siavash finishing in second place. ^Note 1 : As they did not achieve housemate status by successfully completing a challenge, Angel, Beinazir, Marcus, Siavash, Sophia and Sree faced a public vote on Day 4 to decide which five remaining non-housemates would be given housemate status. Beinazir received the least number of votes and was therefore evicted. ^Note 2 : Siavash, playing King Henry VIII in the week's shopping task, was called upon to ban one housemate from nominating and to grant another immunity. He chose Charlie and Marcus respectively. ^Note 3 : As punishment for discussing nominations, Charlie, Dogface and Kris had to remain silent for several hours or they would automatically face eviction. All three failed this task and automatically faced eviction. ^Note 4 : As punishment for discussing nominations, Dogface and Siavash were told not to swear for several hours or they would automatically face eviction. They failed to do so and therefore automatically faced eviction. As this took place before nominations, they were ineligible to be nominated by their fellow housemates. ^Note 5 : As new housemates, Bea, David, Hira, Kenneth and Tom could not nominate and could not be nominated by their fellow housemates. However, they were set a secret mission, in which they had to get Halfwit and Noirin (who were randomly chosen by Hira) nominated for eviction by the other housemates. Failure meant automatically facing the public vote. Charlie and Lisa received the most nominations, therefore the new housemates failed their mission and faced eviction themselves. As punishment for discussing nominations, Charlie, Dogface (who also failed to nominate the required two people for eviction this week), Halfwit, Marcus, Noirin and Siavash also faced the public vote and Big Brother voided all nominations. Therefore, Lisa and Rodrigo were the only two housemates not to face eviction this week. The eviction was later cancelled due to Kenneth walking from the house. During the time the lines were available to vote, Kenneth had received the most votes. ^Note 6 : Bea and Marcus received the most nominations, however Big Brother declared the result void due to Marcus attempting to influence his fellow housemates on several occasions and Siavash refusing to nominate. As punishment, all housemates faced the public vote. Unlike previous weeks, this week was a vote to save. ^Note 7 : On Day 72, Big Brother announced to Halfwit and Dogface that they would revert their names back by deed poll to Freddie and Sophie respectively. As he was evicted on the evening of that same day, the table lists Freddie and not Halfwit as the tenth person to be evicted. ^Note 8 : Siavash and Sophie both refused to nominate. As punishment Big Brother decided, without telling them, that the first two housemates with whom Siavash made physical contact and the first two that Sophie named after leaving the Diary Room would be deemed to be their nominations. Siavash touched Bea and Sophie, and Sophie named Rodrigo and Bea. Therefore, Bea received an additional two nominations and Sophie and Rodrigo each received one extra nomination. ^Note 9 : As a warning to anyone considering to disrupt the nominations process this week, Big Brother chose Charlie and Sophie at random and announced to the House that they would each automatically receive one nomination from anyone refusing to nominate. ^Note 10 : Any housemate who refused to nominate this week was automatically put up for eviction. ^Note 11 : There were no nominations after Lisa's eviction on Day 90. The public voted for whom they wanted to win, rather than evict. Three special, one-off programmes aired on E4 before the launch to commemorate ten years of the programme. The first of which, entitled Jade: As Seen On TV aired on 26 May and commented on the life of Big Brother 2002 contestant Jade Goody and the infamy that surrounded her. The most successful Big Brother housemate worldwide, Goody died of cervical cancer two months before the programme aired. The programme was watched by 305,000 people; 1.8% of the TV audience. Big Brother's Big Quiz, hosted by Davina McCall, aired on 29 May and featured celebrity team captains singer Jamelia, TV presenter and Celebrity Big Brother winner Ulrika Jonsson and comedians Danny Wallace and Jack Whitehall. It also featured former Big Brother housemates such as Craig Phillips and Sam and Amanda Marchant. Big Brother: A Decade in the Headlines was transmitted on 30 May and looked back at the social, political and cultural changes that Big Brother had made to society since it began. The documentary was hosted by Grace Dent and featured participation from Mark Frith, Carole Malone, Oona King, Peter Tatchell, Krishnan Guru-Murthy and Ian Hyland. Spin-off programme Big Brother's Little Brother featured new competitions and features to mark the event. The first, The George Lamb Quiz of the Decade, was launched on 7 June. The participants had to show their knowledge of the programme by participating in a quiz relating to every series of Big Brother. Another competition was established as part of the Greek-themed task in week eight. Here, male Big Brother's Little Brother viewers were asked to apply to become a date for Bea Hammill, who was playing the role of Aphrodite. The contestant chosen was Robin from Bristol. The programme also offered a viewer the chance to become Big Brother and talk to the housemates via the Diary Room on the final day of the programme; this was won by Simon "Jobby" Jobson, a 22-year-old DJ from Alnwick, Northumberland. Former housemates, such as Nadia Almada and Rachel Rice, also appeared as guests to mark the occasion. The shopping task for week seven saw housemates from the previous nine series temporarily return, as current housemates competed against them in a series of "classic" tasks. Former housemates were not paid; a donation was made to Jade Goody's trust fund instead. Phillips was drafted in after "Nasty" Nick Bateman withdrew. Later that day, Lisa competed in a task to build a sugar cube tower alongside Dean O'Loughlin of series two. Day 41 saw Alex Sibley, Sophie Pritchard and Lee Davey from the programme's third edition compete in a re-creation of the egg and spoon race task with Rodrigo trying to predict the outcome. Later that day, Federico Martone from series four participated in a gymkhana competition against Noirin using fake horses and Dogface and Michelle Bass both sang Pie Jesu, which featured in the wedding task of series five, with viewers deciding which performance was the best. On Day 42, Craig Coates and Makosi Musambasi challenged Siavash to the box task from the sixth series and series seven's Nikki Grahame reenacted her silent disco task alongside Karly. The task drew to a close on Day 43 when Rex Newmark from the previous series returned to participate in the electric shock task with Marcus, in which the rest of housemates were subjected to shocks. The housemates failed to pass the required minimum of seven of the nine challenges and therefore failed the overall task. Craig Phillips, winner of the first series of Big Brother, defended this edition of the programme from its critics. In comparison with other contemporary reality television programmes and previous editions of Big Brother, this series has received lower viewing figures and less press coverage. Bookmakers have also reported that this series has attracted the lowest amount of bets placed for any reality programme in the last decade. Four weeks before the programme began, former chat show presenter Michael Parkinson was critical of the programme; "I object to the exploitation of the underclass in shows like Big Brother. It is the modern version of Bedlam, where you pay to see the poor benighted people making asses of themselves". Charlie Brooker of The Guardian said that the series contained forgettable participants and that the producers were alienating the viewers with confusing tasks that seemed to take place "every four minutes". Simmy Richman of The Independent wrote that the programme had become predictable after ten editions and that it had a "here-we-go-again feel". They also complained that the format had become clichéd and the housemates stereotypical, and they criticised the producers for enrolling participants who were using the programme as "a springboard to a Heat magazine cover and temporary free entry to dodgy nightclubs". Maggie Brown, writing in her book A Licence to be Different — The Story of Channel 4, believed that the programme limited its broadcaster as the cost to produce the programme were not justified by the number of viewers it attracted. Mark Lawson, also writing in The Guardian, suggested that the lack of viewers linked with a tired format and minimal press coverage, claiming that the newspapers had become preoccupied with stories such as the outbreak of swine flu, death of Michael Jackson and MPs' expenses scandal. Lawson also believed that the death of Big Brother 2002 participant Jade Goody prior to the launch of Big Brother 2009 contributed to the low viewing figures. Journalist James Donaghy branded the programme a "sorry atrocity" and celebrity gossip blogger Darryn Lyons said that the series had been "massively disappointing", pinpointing Isaac Stout's entrance as a "desperate stunt" to attract viewers. Despite returning to the House to participate in a task, former housemate Dean O'Loughlin has also been critical of this series, describing it as "way too superficial". However, the series has also received praise from various parties. For example, Gerard Gilbert of The Independent argued that in comparison to contemporary TV dramas, Big Brother provides much more entertainment, psychological depth and social impact. Gilbert also commented that the storylines of the programme were equal to that of the works of Samuel Beckett. Craig Phillips, the winner of the first series of Big Brother, and the programme's presenter Davina McCall have responded to the criticisms of the programme's decreasing viewing figures, respectively arguing that the programme achieves low numbers due to the different way in which viewers can watch the programme and that the programme is achieving well considering its timeslot and broadcaster. Brian Dowling, who won the second edition of Big Brother in 2001, defended both the programme and the reality genre as a whole, telling BBC Breakfast that producers were simply providing viewers what they want, such as extreme participants. The Guardian's Heidi Stephens also complimented the series by claiming that it has "seen the emergence of some truly fascinating personalities" and welcomed the return to the basic format of the programme. Stephens went on to compare the storylines and characters of the programme with that of a John Hughes film. Aisleyne Horgan-Wallace, who came third in the seventh series, and Big Brother 2003 winner Cameron Stout praised the selection of housemates, both claiming that the quality of the programme had improved on previous years. Entertainment website Digital Spy was also complimentary of the series, naming Sophie "Dogface" Reade and Kris Donnelly as two of the sexiest housemates of the past ten years and Angel McKenzie as one of the most outrageous. Towards the end of the programme's airing, Neil Boom of The Independent argued that the series is "one of the best ever" despite a decline in the number of viewers. He claimed that there was still high interest on internet forums and that the lower television ratings might be due to the removal of the 24-hour live feed. He praised the selection of housemates and highlighted Siavash, Freddie and Marcus as particular examples. Following the end of the series, Davina McCall also considered Big Brother 10 to be "Big Brother at its best." ^ a b c Parker, Robin (4 June 2009). "Big Brother housemates set for gruelling start". Broadcast. Retrieved 3 September 2009. ^ "C4 secures Big Brother until 2010". BBC. 30 November 2006. Retrieved 13 May 2009. ^ a b c Holmwood, Leigh (24 August 2009). "The fallout from 15 minutes of fame". London: The Guardian. Retrieved 3 September 2009. ^ a b McKenzie, Greg (4 June 2009). "What's the Big Brother house like?". BBC. Retrieved 3 September 2009. ^ Davina McCall (23 January 2009). "Celebrity Big Brother 6: Live Final". Celebrity Big Brother. Season 6. Channel 4. ^ Fletcher, Alex (12 May 2009). "Big Brother 10 eye revealed". Digital Spy. Archived from the original on 15 May 2009. Retrieved 13 May 2009. ^ Eatock, Daniel (11 May 2009). "Big Brother 10 Logo". www.eatock.com. Retrieved 3 September 2009. ^ "Big Brother 10 - Get ready.... - Channel 4". Channel 4/YouTube. 19 May 2009. Retrieved 25 May 2009. ^ Thomas, Joe (19 May 2009). "Tonic for Big Brother 10 as Lucozade Energy signs up as main sponsor". Marketing Magazine. Retrieved 29 May 2009. ^ a b c d Parker, Robin (20 August 2009). "Big Brother: The house of confrontation". Broadcast. Retrieved 25 August 2009. ^ a b c d Davina McCall, Marcus Bentley, Sophie Reade, Rodrigo Lopes, Charlie Drummond, Siavash Sabbaghpour, David Ramsden, Judy James (4 September 2009). "Big Brother 2009: Live Final". Big Brother. Season 10. Channel 4. ^ Gilbert, Gerard (1 June 2009). "The return of Big Brother". Herald. Retrieved 11 June 2009. ^ Balls, David (26 March 2009). "McCall to front weekly 'Big Mouth'". Digital Spy. Archived from the original on 29 April 2009. Retrieved 13 May 2009. ^ Allen, Kelly (18 May 2009). 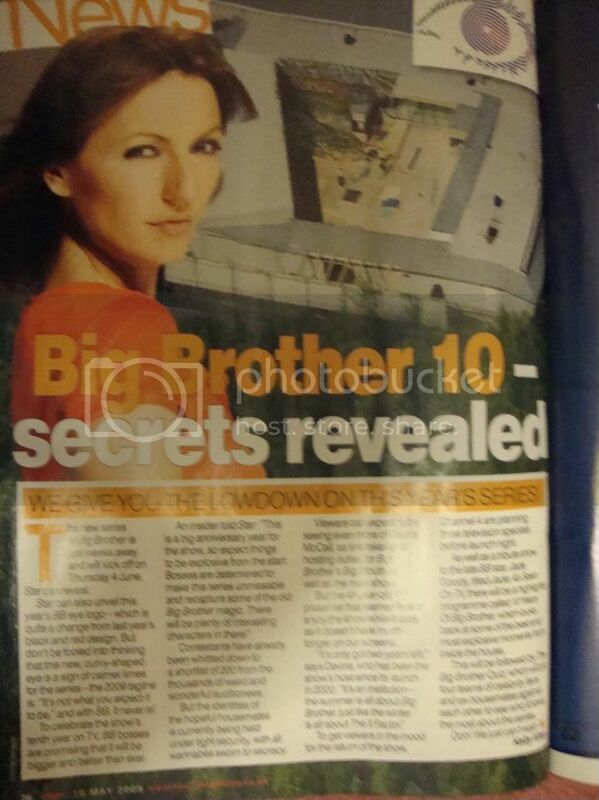 "Big Brother 10 - Secrets Revealed". Star. ^ Fletcher, Alex (1 June 2009). "Big Brother 10 house pictures revealed". Digital Spy. Archived from the original on 3 June 2009. Retrieved 1 June 2009. ^ "Big Brother 10: inside the 2009 contestants' house". London: The Guardian. 1 June 2009. Retrieved 3 September 2009. ^ a b "BB housemates facing 'hell'". Metro. 3 June 2009. Retrieved 4 June 2009. ^ "Rules". Channel 4. 5 June 2008. Archived from the original on 13 June 2009. Retrieved 5 June 2009. ^ "About Big Brother". Channel 4. 4 June 2009. Archived from the original on 11 June 2009. Retrieved 5 June 2009. ^ a b Plunkett, John (8 June 2009). "Big Brother phone vote charity donations scrapped by Channel 4". London: The Guardian. Archived from the original on 12 June 2009. Retrieved 9 June 2009. ^ "BB eviction-night twist is going to be UNMISSABLE!". Heat. 12 June 2009. Retrieved 12 June 2009. ^ a b Nissim, Mayer (12 June 2009). "BB promises evictee 'interrogation'". Digital Spy. Archived from the original on 15 June 2009. Retrieved 12 June 2009. ^ Fletcher, Alex (4 June 2009). "Fake romances banned in Big Brother 10". Digital Spy. Retrieved 8 August 2009. ^ a b "Karly out as boyfriend joins BB". BBC. 17 July 2009. Retrieved 21 July 2009. ^ a b c d e f g h i j k l m n "Big Brother 10 underway". Broadcast. 5 June 2009. Retrieved 25 August 2009. ^ Atkinson, Neil (27 July 2009). "Starstruck David Ramsden's a real big brother". The Huddersfield Daily Examiner. Retrieved 28 July 2009. ^ Duarte, Fernando (29 June 2009). "Brasileiro bissexual faz sucesso em Big Brother inglês". O Globo. Retrieved 26 August 2009. ^ "Big Brother: Bea booted out". Manchester Evening News. 22 August 2009. Retrieved 26 August 2009. ^ "Hira latest Big Brother evictee". BBC. 8 August 2009. Retrieved 26 August 2009. ^ a b "BB pals set to boot out Noirin as old flame rattles love rival". Evening Herald. 31 July 2009. Retrieved 5 August 2009. ^ "Tom quits the Big Brother house". BBC. 27 July 2009. Retrieved 26 August 2009. ^ a b "Kenneth walks out of Big Brother". BBC. 23 July 2009. Retrieved 23 July 2009. ^ a b c d e f g "Big Brother 10: Meet the housemates". BBC News Online. 5 June 2009. Retrieved 5 June 2009. ^ a b c d e f Singh, Anita (5 June 2009). "Big Brother 10: housemates announced". The Daily Telegraph. London. Retrieved 5 June 2009. ^ Worden, Andrew (4 June 2009). "Big Brother contestant is adopted daughter of Croydon boxing legend". thisiscroydontoday.co.uk. Retrieved 2 September 2009. ^ TalkTalk plc - Web Studio. "Unlimited TV, Broadband and Phone Packages: Now with FREE YouView+ Box - TalkTalk". tiscali.co.uk. Archived from the original on 26 August 2009. ^ a b "Big Brother claims first victim". BBC News. 8 June 2009. Retrieved 9 June 2009. ^ "Big Brother: Cairon Austin-Hill". Biogs. ^ Singh, Anita (5 June 2009). "Big Brother 10: housemates announced". The Daily Telegraph. London. ^ "Gettin' Down". The Real World. Season 19. Episode 23. ^ "Karly bookies' favourite to be evicted". Digital Spy. ^ Menhinnitt, Dan (22 July 2009). "Kenneth warned after Bea row". The Sun. London. ^ men Administrator (27 April 2010). "BB10: Kris booted out". men. ^ "Marcus given warning over Sree argument". Digital Spy. ^ "Noirin said she was going to US, not into BB house -- mum". Evening Herald. 6 June 2009. Retrieved 6 June 2009. ^ Jennings, Christine (14 June 2009). "Specsy Noirin sparks row". London: Sun Online. Retrieved 14 June 2009. ^ Risley, Matt (14 June 2009). "Noirin to go on hunger strike?". Digital Spy. Retrieved 14 June 2009. ^ "Big Brother star Rebekah Shelton not dead after 'hack'". BBC Newsbeat. 12 January 2018. Retrieved 6 January 2019. ^ Silverstein, Adam (11 June 2009). "Saffia leaves Big Brother house". Digital Spy. Retrieved 11 June 2009. ^ a b c Hilton, Beth (12 June 2009). "Sophia: 'I was myself in house'". Digital Spy. Retrieved 12 June 2009. ^ "Big Brother 10 contestant Sophia Brown dies, aged 30". Digital Spy. ^ "Sophie Reade". Hot Shots Calendar. Retrieved 8 January 2014. ^ Harris, Will (15 July 2009). "Nantwich glamour model Sophie Reade faces eviction for second week running". Crewe Chronicle. Retrieved 8 January 2014. ^ Ellington-Brown, Lara (5 September 2009). "Sophie Reade wins Big Brother". Daily Express. Retrieved 8 January 2014. ^ "Sophie Reade wins Big Brother 10". The Telegraph. 4 September 2009. Retrieved 8 January 2014. ^ Addley, Esther (30 July 2009). "Big Brother contestant Sree Dasari slashes his wrists". The Guardian. London. Retrieved 8 May 2010. ^ "insidebigbrother.net - Sinner Street". insidebigbrother.net. Archived from the original on 29 July 2009. ^ "Big Brother 10 – the first HUGE twist is revealed!". Heat. 4 June 2009. Retrieved 4 June 2009. ^ "Big Brother is definitely evil again this year..." Heat. 4 June 2009. Retrieved 4 June 2009. ^ Nissim, Mayer (5 June 2009). "BB houseguests forced to switch clothes". Digital Spy. Archived from the original on 7 June 2009. Retrieved 5 June 2009. ^ Nissim, Mayer (5 June 2009). "Lisa, Kris become official housemates". Digital Spy. Archived from the original on 7 June 2009. Retrieved 5 June 2009. ^ Reynolds, Matthew (5 June 2009). "Charlie, Saffia now official housemates". Digital Spy. Archived from the original on 7 June 2009. Retrieved 5 June 2009. ^ "Karly becomes the seventh official housemate!". Heat. 5 June 2009. Retrieved 5 June 2009. ^ "Blimey! Now Freddie and Sophie are housemates too!". Heat. 5 June 2009. Retrieved 5 June 2009. ^ "Big Brother: Cairon wins final 'housemate' task". What's on TV. 6 June 2009. Retrieved 19 February 2010. ^ a b "Big Brother claims first victim". BBC. 8 June 2009. Archived from the original on 12 June 2009. Retrieved 8 June 2009. ^ a b Grieves, Jen (10 June 2009). "Freddie, Sophia up for eviction". Digital Spy. Archived from the original on 12 June 2009. Retrieved 10 June 2009. ^ Marsh, Jenni (12 June 2009). "Kris passes James Bond test". Digital Spy. Archived from the original on 15 June 2009. Retrieved 13 June 2009. ^ Routledge, Rebecca (12 June 2009). "Saffia denies leaving over Kris, Sophie". Digital Spy. Archived from the original on 15 June 2009. Retrieved 13 June 2009. ^ Marsh, Jenni (18 June 2009). "Housemates pass 'Ole Bamboo' task". Digital Spy. Archived from the original on 21 June 2009. Retrieved 20 June 2009. ^ Wightman, Catriona (22 June 2009). "Freddie given "The Gift of Normality"". Digital Spy. Archived from the original on 25 June 2009. Retrieved 23 June 2009. ^ Marcus Bentley, Freddie "Halfwit" Fisher, Lisa Wallace, Sophie "Dogface" Reade, Kris Donnelly, Noirin Kelly, Angel McKenzie, Karly Ashworth, Marcus Akin, Rodrigo Lopes, Charlie Drummond, Sree Dasari, Siavash Sabbaghpour (24 June 2009). "Big Brother 2009: Day 20". Big Brother. Season 10. Channel 4. ^ Reynolds, Matthew (23 June 2009). "Charlie exempt from this week's nominations". Digital Spy. Archived from the original on 26 June 2009. Retrieved 27 June 2009. ^ Wightman, Catriona (23 June 2009). "Marcus immune from nominations?". Digital Spy. Archived from the original on 27 June 2009. Retrieved 27 June 2009. ^ Taylor, Polly (24 June 2009). "Angel, Freddie face public vote". Digital Spy. Archived from the original on 26 June 2009. Retrieved 27 June 2009. ^ "Noirin discovers her inner artist". MSN. 3 July 2009. Archived from the original on 13 August 2009. Retrieved 24 July 2009. ^ Reynolds, Matthew (7 July 2009). "Five housemates up for eviction". Digital Spy. Retrieved 7 July 2009. ^ "Big Brother - 'Circus' Task Failed". Contactmusic.com. 9 July 2009. Retrieved 11 July 2009. ^ a b Wightman, Catriona (10 July 2009). "Kris evicted!". Digital Spy. Retrieved 11 July 2009. ^ "Shock Big Brother exit for Kris". BBC. 10 July 2009. Retrieved 13 July 2009. ^ "Dogface, Siavash face public vote!". What's on TV. 12 July 2009. Retrieved 13 July 2009. ^ a b c d "Nasty Nick pulls out of BB return". BBC. 13 July 2009. Archived from the original on 15 July 2009. Retrieved 13 July 2009. ^ Reynolds, Matthew (13 July 2009). "Four housemates up for eviction". Digital Spy. Retrieved 19 February 2010. ^ a b Reynolds, Matthew (21 July 2009). "Housemates set Greek shopping task". Digital Spy. Retrieved 19 February 2010. ^ a b Wightman, Catriona (17 July 2009). "Karly: 'Marcus is a disgusting pig'". Digital Spy. Retrieved 21 July 2009. ^ "Charlie and Rodrigo – just what IS going on?". Heat. 21 July 2009. Retrieved 21 July 2009. ^ Reynolds, Matthew (24 July 2009). "Greek shopping task twist revealed". Digital Spy. Retrieved 28 July 2009. ^ "OMG! Almost ALL the housemates are up for eviction!". Heat. 21 July 2009. Retrieved 21 July 2009. ^ a b Grieves, Jen (26 July 2009). "Tom walks out of the Big Brother house". Digital Spy. Retrieved 26 July 2009. ^ a b Wightman, Catriona (31 July 2009). "Isaac leaves Big Brother house". Digital Spy. Retrieved 1 August 2009. ^ a b Wightman, Catriona (31 July 2009). "Noirin: 'I did lead Siavash on'". Digital Spy. Retrieved 1 August 2009. ^ "BB housemates all up for eviction". BBC. 5 August 2009. Retrieved 5 August 2009. ^ Reynolds, Matthew (6 August 2009). "'Alice' Hira tackles giant cupcake". Digital Spy. Retrieved 6 August 2009. ^ Grieves, Jen (10 August 2009). "Freddie loses housemates' shopping". Digital Spy. Retrieved 4 April 2009. ^ a b "Big Brother: Halfwit and Marcus face eviction". What's on TV. 12 August 2009. Retrieved 4 April 2010. ^ Marsh, Jenni (11 August 2009). "Housemates tested on British etiquette". Digital Spy. Retrieved 4 April 2010. ^ Grieves, Jen (13 August 2009). "Rodrigo recounts 'Queen' experience". Digital Spy. Retrieved 4 April 2010. ^ Marsh, Jenni (14 August 2009). "Halfwit and Dogface get names back". Digital Spy. Retrieved 20 August 2009. ^ Routledge, Rebecca (18 August 2009). "Charlie to perform surgery for task". Digital Spy. Retrieved 4 April 2010. ^ a b "Big Brother 10 - Bea's best bits". TalkTalk Group. Archived from the original on 26 August 2009. Retrieved 24 August 2009. ^ Marcus Bentley, [Lisa Wallace, Sophie Reade, Marcus Akin, Rodrigo Lopes, Charlie Drummond, Siavash Sabbaghpour, David Ramsden (26 August 2009). "Big Brother 2009: Day 83". Big Brother. Season 10. Channel 4. ^ "'Big Brother bosses ditch £100,000 prize for winner'". London: The Daily Telegraph. 27 August 2009. Retrieved 27 August 2009. ^ Davina McCall, Marcus Bentley, Lisa Wallace, Sophie Reade, Marcus Akin, Rodrigo Lopes, Charlie Drummond, Siavash Sabbaghpour, David Ramsden (28 August 2009). "Big Brother 2009: Day 85". Big Brother. Season 10. Channel 4. ^ Marsh, Jenni (28 August 2009). "BB tempts housemates with cash". Digital Spy. Retrieved 29 August 2009. ^ Marcus Bentley, Lisa Wallace, Sophie Reade, Marcus Akin, Rodrigo Lopes, Charlie Drummond, Siavash Sabbaghpour, David Ramsden (29 August 2009). "Big Brother 2009: Day 86". Big Brother. Season 10. Channel 4. ^ a b Wightman, Catriona (28 August 2009). "Marcus: 'Nothing I did was serious'". Digital Spy. Archived from the original on 2 October 2009. Retrieved 29 August 2009. ^ Wightman, Catriona (30 August 2009). "Group passes 'task with no name'". Digital Spy. Archived from the original on 3 October 2009. Retrieved 30 August 2009. ^ Wightman, Catriona (30 August 2009). "Housemates given nominations quiz". Digital Spy. Archived from the original on 3 October 2009. Retrieved 1 September 2009. ^ Grieves, Jen (1 September 2009). "All housemates face public vote". Digital Spy. Archived from the original on 5 October 2009. Retrieved 4 September 2009. ^ Grieves, Jen (1 September 2009). "Housemates see an episode of BB". Digital Spy. Archived from the original on 5 October 2009. Retrieved 1 September 2009. ^ Davina McCall, Marcus Bentley, Lisa Wallace, Sophie Reade, Rodrigo Lopes, Charlie Drummond, Siavash Sabbaghpour, David Ramsden (1 September 2009). "Big Brother 2009: Day 89". Big Brother. Season 10. Channel 4. ^ Reynolds, Matthew (1 September 2009). "Housemates to undergo Beyoncé task". Digital Spy. Archived from the original on 5 October 2009. Retrieved 2 September 2009. ^ Taylor, Polly (1 September 2009). "Charlie upset with role in Beyoncé task". Digital Spy. Archived from the original on 5 October 2009. Retrieved 2 September 2009. ^ Grieves, Jen (2 September 2009). "HMs given screening of re-enactment task". Digital Spy. Archived from the original on 8 October 2009. Retrieved 2 September 2009. ^ a b Wightman, Catriona (1 September 2009). "Lisa: 'I feel lucky to have got so far'". Digital Spy. Archived from the original on 5 October 2009. Retrieved 1 September 2009. ^ Marcus Bentley, Sophie Reade, Rodrigo Lopes, Charlie Drummond, Siavash Sabbaghpour, David Ramsden (3 September 2009). "Big Brother 2009: Day 91". Big Brother. Season 10. Channel 4. ^ "Sophie crowned Big Brother winner". BBC. 5 September 2009. Retrieved 6 April 2010. ^ a b Wightman, Catriona (4 September 2009). "Rodrigo finishes in fifth place". Digital Spy. Retrieved 5 September 2009. ^ a b "Big Brother: Rodrigo fifth, Charlie fourth!". What's on TV. 4 September 2009. Archived from the original on 20 February 2012. Retrieved 10 February 2010. ^ a b Wightman, Catriona (4 September 2009). "David finishes in third place". Digital Spy. Retrieved 5 September 2009. ^ Routledge, Rebecca (6 June 2009). "Cairon wins final housemate place". Digital Spy. Archived from the original on 8 June 2009. Retrieved 6 June 2009. ^ Routledge, Rebecca (18 August 2009). "Bea, Marcus, David up for eviction". Digital Spy. Retrieved 19 February 2009. ^ a b "TV Preview: Jade: As Seen On TV – E4, 10pm". This is Staffordshire. 26 May 2009. Retrieved 29 May 2009. ^ French, Dan (27 May 2009). "12.8 million tune in for third 'Talent' semi". Digital Spy. Archived from the original on 30 May 2009. Retrieved 1 June 2009. ^ a b "Big Brother's Big Quiz". Borehamwood Times. 27 May 2009. Archived from the original on 22 July 2009. Retrieved 29 May 2009. ^ a b "Big Brother: A Decade in the Headlines". Sky News. 27 May 2009. Archived from the original on 15 June 2009. Retrieved 29 May 2009. ^ Dent, Grace (29 May 2009). "Grace Dent's 10 unsung Big Brother heroes". London: The Guardian. Archived from the original on 11 June 2009. Retrieved 30 May 2009. ^ "Satellite Pick of the Day - June 01, 2009". California Chronicle. 1 June 2009. Archived from the original on 6 July 2009. Retrieved 1 June 2009. ^ George Lamb, Luke Pasqualino, Klariza Clayton, Neil Hamilton, Rob Yeung, Makosi Musambasi (7 June 2009). "Big Brother's Little Brother: Day 3". Big Brother. Season 9. E4. ^ "Win a date with Bea!". TalkTalk Group. 21 July 2009. Archived from the original on 13 August 2009. Retrieved 4 August 2009. ^ Routledge, Rebecca (22 July 2009). "Bea meets her date in Greek task". Digital Spy. Retrieved 4 August 2009. ^ Brooks, Robert (3 September 2009). "Meet the voice of Big Brother". Northumberland Gazette. Retrieved 4 September 2009. ^ Wightman, Catriona (17 July 2009). "Previous winners to appear on BBLB". Digital Spy. Retrieved 4 August 2009. ^ Taylor, Polly (13 July 2009). "Lisa, Dean compete in sugar tower task". Digital Spy. Retrieved 4 August 2009. ^ Reynolds, Matthew (14 July 2009). "Rodrigo bets on BB3 egg and spoon race". Digital Spy. Retrieved 4 August 2009. ^ Marsh, Jenni (14 July 2009). "Federico, Noirin tackle gymkhana task". Digital Spy. Retrieved 4 August 2009. ^ "Big Brother - Michelle Bass v Dogface YOU decided - Channel 4". Channel 4/YouTube. 14 July 2009. Retrieved 4 August 2009. ^ "Makosi and Craig confuse housemates". Channel 4. 16 July 2009. Retrieved 4 August 2009. ^ Routledge, Rebecca (16 July 2009). "Noirin, Lisa quit electric shock task". Digital Spy. Retrieved 4 August 2009. ^ Holmwood, Leigh (8 July 2009). "Big Brother prompts 290 complaints". London: The Guardian. Archived from the original on 12 July 2009. Retrieved 11 July 2009. ^ Holmwood, Leigh (1 June 2009). "Will enough people be watching Big Brother?". London: The Guardian. Archived from the original on 13 June 2009. Retrieved 12 July 2009. ^ Reynolds, Matthew (19 June 2009). "Bets on BB at an all-time low". Digital Spy. Archived from the original on 22 June 2009. Retrieved 13 July 2009. ^ Day, Elizabeth (17 May 2009). "This much I know: Michael Parkinson, journalist, 74, London". The Guardian. Retrieved 2 August 2009. ^ Brooker, Charlie (13 June 2009). "Charlie Brooker's screen burn". London: The Guardian. Archived from the original on 16 June 2009. Retrieved 12 July 2009. ^ Brooker, Charlie (11 July 2009). "Charlie Brooker's screen burn". London: The Guardian. Archived from the original on 15 July 2009. Retrieved 12 July 2009. ^ a b Richman, Simmy (14 June 2009). "Big Brother, Channel 4, Living With Monkeys: Tales From the Treetops, BBC1". London: The Independent. Archived from the original on 18 June 2009. Retrieved 12 July 2009. ^ Brown, Maggie (24 July 2009). "Big Brother is holding Channel 4 back". London: The Guardian. Archived from the original on 27 July 2009. Retrieved 26 July 2009. ^ a b Lawson, Mark (24 July 2009). "Is it time to kill off Big Brother?". London: The Guardian. Archived from the original on 26 July 2009. Retrieved 26 July 2009. ^ Donaghy, James (25 July 2009). "James Donaghy's screen burn". London: The Guardian. Archived from the original on 28 July 2009. Retrieved 2 August 2009. ^ Lyons, Darryn (30 July 2009). "Noirin's Ex-Boyfriend Boosts BB Ratings..." Mr Paparazzi.com. Archived from the original on 4 August 2009. Retrieved 2 August 2009. ^ Fletcher, Alex (31 July 2009). "Dean O'Loughlin ('Big Brother 2')". Digital Spy. Retrieved 2 August 2009. ^ a b Gilbert, Gerard (29 May 2009). "The return of Big Brother". London: The Independent. Retrieved 26 July 2009. ^ Fletcher, Alex (28 May 2009). "BB Craig defends falling viewing figures". Digital Spy. Archived from the original on 22 June 2009. Retrieved 27 July 2009. ^ Nissim, Mayer (9 June 2009). "Davina McCall: 'Get over BB ratings'". Digital Spy. Archived from the original on 12 June 2009. Retrieved 27 July 2009. ^ a b Stephens, Heidi (30 July 2009). "Look again: Big Brother's back on form". London: The Guardian. Retrieved 2 August 2009. ^ Fletcher, Alex (2 July 2009). "Aisleyne Horgan-Wallace ('Big Brother 7')". Digital Spy. Retrieved 2 August 2009. ^ Fletcher, Alex (25 June 2009). "Cameron Stout ('Big Brother 4')". Digital Spy. Archived from the original on 28 June 2009. Retrieved 2 August 2009. ^ Fletcher, Alex (15 July 2009). "Big Brother: The Sexiest BB Women". Digital Spy. Retrieved 3 August 2009. ^ Fletcher, Alex (14 July 2009). "The Sexiest BB Men". Digital Spy. Retrieved 3 August 2009. ^ Fletcher, Alex (16 July 2009). "Big Brother: The Most Outrageous". Digital Spy. Retrieved 3 August 2009. ^ Neil Boom (31 August 2009). "My Orwellian nightmare: a future without Big Brother". The Independent. London. Retrieved 1 September 2009. ^ Mayer Nissim (8 September 2009). "Davina McCall: 'BB10 was show at its best'". Digital Spy. Archived from the original on 14 October 2009. Retrieved 8 September 2009.